Delightful Condo, Ideal Location, Fabulous View, Free Shuttle! No matter what the reason, or the season, everything you come to Sun Valley for are all just a few steps away or a short ride on the free bus that stops just a few steps from your door when you choose this condo. Located in Warm Springs, the most beloved neighborhood in the Sun Valley/Ketchum area, you will be just a few blocks from Ernest Hemingway's final and most cherished home. Hemingway chose Warm Springs for many reasons, but most of all because it is at the nexus between the the cultural amenities of a World-Class Resort and the Wild, Natural Beauty of Idaho that he so loved. This very clean, extremely comfortable, and exceptionally appealing condo is located at the very heart of all the best that Warm Springs, Ketchum, and Sun Valley has to offer. SKIERS WILL LOVE being able to just cross the street, step on a bus, and be dropped off within a few steps of the fastest lift to the top of Bald Mountain in just four minutes. So close, yet just far enough away to be out of the reach of Baldy's chilly shadow and the irritating, night-long, roar of snow-making and grooming machines. SUMMER HIKERS AND BIKERS will be blessed with virtually unlimited trails within the spectacular Sawtooth National Forest just a block away, as well as 78 acres of gorgeous open space bordered on one side by Bald Mountain and a beautiful trout stream on the other. Plus, the 38-mile-long Wood River paved bike/pedestrian path is just out front. DO YOU THRIVE ON DINING, SHOPPING, ART, golf, night-life, fitness, and cultural events? From here you can walk or take a short bus ride to within a block or two of most restaurants, shops, galleries, golf courses, the fabulous new Wood River YMCA, as well as the many cultural events that take place throughout the year, all without the stress of dealing with traffic or parking hassles. WHAT EVER YOU VISIT SUN VALLEY FOR it's all nearby and easy to get to even without a car when you stay at this convenient and centrally-located, yet peaceful and relaxing condo! An open floor plan with walls of windows and high, sloping ceilings give a spacious, bright, and cheerful feeling by day. By night it has a cozy and romantic atmosphere with a real wood-burning fireplace as the focal point of the living room. You'll feel right at home with its charming and tasteful decor and extremely comfortable furnishings. Nestled in the treetops, above all nearby residences, you'll enjoy total privacy as well as expansive views of breath-taking mountain scenery whether inside the condo or out on its huge, comfortably furnished private balcony. The extended roof line keeps the balcony, as well as the private walkway to the street, protected from rain, snow, and ice for year-round comfort and safety. Stretch out and relax on the cushioned deck furniture in cool shaded comfort during summer or bask in the soothing warmth of the sun in winter. The well-designed and fully-equipped kitchen with dishwasher make culinary creation and clean-up a breeze. There's also a wonderful gas BBQ on the deck. Easily prepare a home-cooked meal or have one delivered from one of the many excellent restaurants and then enjoy it with a view and ambiance that can't be out-done by the best restaurants in town. The bedroom is handsomely furnished in solid oak with plenty of drawers and a luxurious new memory-foam queen mattress that will ensure a restful ending to your fun-filled days. The immaculate bathroom is well-stocked with towels, plus a hairdryer. TOP-FLOOR ADVANTAGES WITH GROUND-FLOOR CONVENIENCE! Although it enjoys an ideal top-floor-corner location, access to this condo is just as easy as a ground-floor unit. No hassles with stairs or elevators because the building is built into a hillside with private parking, a bus stop, and a multitude of recreational opportunities just a few steps away without flights of stairs to climb. You can easily walk or pedal into town, or just hop on the bus that stops in front of the building every 15-30 minutes and will get you within a block or two of all the most popular places and events you'll want to get to in the Wood River Valley. The buses are modern and comfortable and will get you anywhere in the Sun Valley/Ketchum area in less time than it would take you to drive and park, or even walk, from most in-town locations. All the buses have bike- and ski-racks so you can mix your transportation modes, if you like. No rental car expense, scraping windshields, parking hassles, or designated driver necessary; but if you want to explore further than your two feet or our excellent bus system will take you, a rental car can be delivered right to your door whenever you need it. The cleanliness and quality of this condominium will please even the most discerning guests. Smoking is not permitted and we accept only clean, well-behaved pets and conscientious pet-owners. To ensure that our guests respect our property and policies, we require a security deposit and a signed rental agreement. on a rental property that has no or only so-so ratings and reviews, or unverifiable owner-submitted reviews. You are assured of a highly enjoyable rental experience when you book this condo since it has one of the best reputations among Sun Valley's many rental offerings with 9 years' worth of solid 5-star ratings and rave reviews from genuine, VRBO-certified guests. Ernest Hemingway could afford to live in the best of all places and now you can, too, because our rates are so reasonable for what you get. Our tourist seasons are usually fully booked, so get your reservation in early! 'Not Rich, Just Lucky!' Lestia and her two better halves, Freddie the dog and Buzzy the horse, spend most of their time on their rustic and remote horse ranch about 20 miles northeast of Sun Valley, but enjoy spending time in town, too. The condo is ideal for this mixed-species family since it is close to all the amenities of town for Lestia, a corral for Buzzy, plus mountain trails, meadows, and streams nearby where Freddie, Buzzy, and Lestia can all play and gallivant to their heart's content. I spent years looking for just the right place to buy in the Sun Valley/Ketchum area. The location of this condo has the perfect balance between access to in-town amenities, ski lifts, public transportation, and an abundance of recreational opportunities all within easy walking distance. Plus its location on the top floor corner with a huge balcony and gorgeous views just can't be beat. All this at a price that is so affordable! The balcony is what sets this condo apart from all others. It is larger and has a better view than most of the multi-million dollar condos in the area. And it is so comfortable, like an extension of the living room with outdoor carpeting, cushioned furniture, plenty of winter sunshine, or summer shade. It's a great spot to have wine and snacks after a day of skiing, hiking, horseback riding, or whatever activities you might enjoy. Another unique feature of the property is that you can walk directly from my condo on the top floor to the street without climbing stairs or using elevators. This is possible because the building was built into the side of a hill that is as high as the top floor. A covered, elevated walkway extends from my door to the opposite side of the building and the street where private parking and a bus stop are just steps away. Incredibly convenient! Ketchum is at the heart of all of the best of Sun Valley's resort amenities. This condo overlooks the former Warm Springs Ranch Golf Course. It is now a gorgeous 78-acre public park where dogs and people come to stroll, play and enjoy the beauty of Idaho. Close-up view of Bald Mountain - Sun Valley's Premier skiing mountain! Very large covered and carpeted balcony with comfortable deck furniture and expansive mpintain views. Laundry, maid, firewood delivery, and concierge services for an additional charge. Have been visiting Sun Valley since the years of single chair lifts @ River Run & so my wife & I have certain requirements & Lestia's condo has just what we need & like. The location is ideal, a short drive to down town & bus stops across the street for getting to the lifts or down town. The parking is convenient just across the street and same level as the unit. The view is very special being 4 floors up, with a large deck, looking out across the Warm Springs River & a 180 degree view of the rising mountains beyond. The unit was well provisioned & equipped & the bed was more comfortable than our own. Lestia was very courteous, timely in her communications & well organized in her booking, invoicing & arrival guest guide info for the unit that she provided. Lestia, we are most glad to have made a new friend & will be back next winter to enjoy it all again! Thank you for the thoughtful review. I am looking forward to having you back as guests again and again! Very nice and easly accessible. A few items that were negative, screen door bent and wont lock, sliding glass door modified and does not lock, sticky kitchen floors and counters. Nothinf of significance but could be improved. Would rent again if available. Perfect place for two, close to skiing or hiking and town. We had a very nice time in Ketchum. 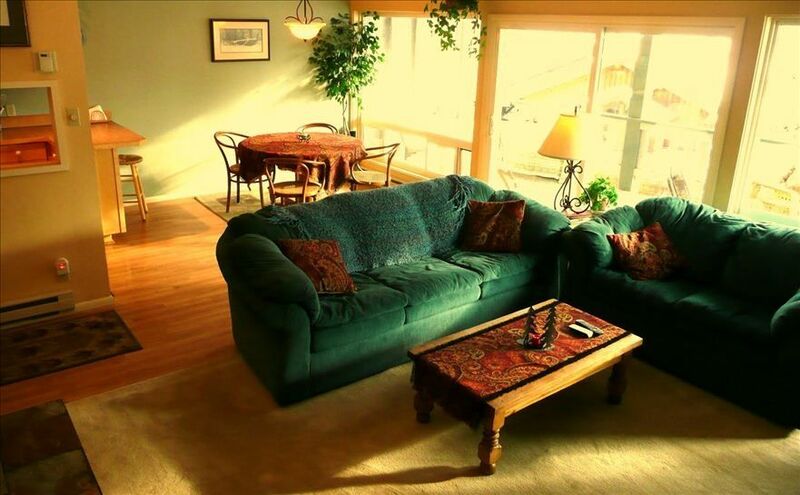 The condo is in a quiet area with great walking access to town or short drive to world class hiking and skiing. All the amenities are included, with a great outdoor area to enjoy the weather and views of the mountain. Great place. She was very responsive. Unit was great. Exterior of other units could use some clean up but other than that, it was fine. Great location, nice deck, Sun Valley/ Ketchum area is awesome. It was great dealing with Lestia, excellent communication, very accommodating, thank you. COZY ... it doesn't get any better than that! My husband, John, and our little Cardigan Welsh corgi, Brynllyn, and I were charmed from the moment we opened the door to enter what would be our winter wonderland home for the week. On the days we didn't drive the two or three minutes to the lodge to catch the first chair up, our mornings were spent drinking coffee at the table, captured by the view of the snowy, tree-covered mountains. Many little necessities were provided in the kitchen ... a whole array of spices, salt and pepper shakers, cooking oil, brown sugar, etc. There were plenty of pots and pans and dishes and glasses and mixing bowls ... anything you'd need to prepare a wonderful meal, or even bake, if one were so inclined. There were plenty of nice hangers in the closets (a first)! The bed was comfortable and cozy. A special sheet was provided to cover the couch or loveseat or bed so that Brynllyn didn't get hair all over. He was particularly delighted to find a bowl of fresh water waiting for him when we arrived. We hope to return to this wonderland next year, most likely for TWO weeks! It was such a pleasure to host the two of you and your adorable fur-baby. You will always be welcomed back! Hiking/biking/snowshoeing trails all within a block. Downhill skiing is a 4-minute ride on the free and comfortable bus service that will also take you anywhere you are likely to want to go in the Ketchum/Sun Valley area. All restaurants, shops, events, winter and summer recreation and local attractions are within a short walk or bus ride. Just down the street is the fabulous new Wood River YMCA with gym, pools, spas, steam room, climbing wall, yoga, and much more! No location in the Sun Valley area is more central to all the amenities and recreational opportunities that the area has to offer!